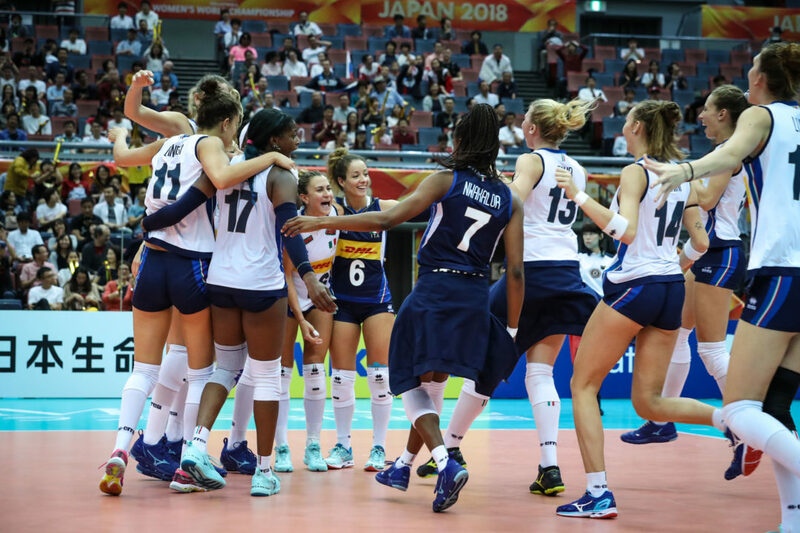 7th-ranked Italy and top-ranked China qualified for 2018 FIVB Women’s World Championship 3rd round action with victories on Wednesday night inside Osaka Municipal Central Gymnasium. The Italians remain undefeated at 8-0 with 24 points, while the Russians stand at 7-1 with 21 points. 12th-ranked Turkey battled its way to a 4-set victory over 24th-ranked Azerbaijan inside Osaka Municipal Central Gymnasium Wednesday night. The Turks used a strong blocking front (14 to 11) and an edge on the service line (8 to 7) to move to 4-4 with 12 points in 2018 FIVB Women’s World Championship action. Turkey was led to victory by Meryem Boz, who registered 23 points, and Meliha Ismailoglu, who tallied 13 points. For Azerbaijan, Natalya Mammadova and Odina Aliyeva recorded 22 and 10 points, respectively in the loss. Though the Turks emerged the victor, head coach Giovanna Guidetti sees room for improvement. 17th-ranked Bulgaria outlasted a tough 16th-ranked Thailand squad on Wednesday in Pool F action. The Bulgarians outdid the injury-ridden Thais in blocks (13 to 10) to secure the final victory. Thailand has been without opposite Kokram Pimpichaya and spiker Kongyot Ajcharaporn due to injury. Pimpichaya has been out since Oct. 2 when she sustained a right knee injury against Trinadad and Tobego, while Aijcharaporn exited Thailand’s match against the United States on Oct. 3 with an ankle injury. The Thais have been able to work Chatchu-On Moksri into the lineup to play on a limited basis as a serving specialist. The 16-year-old is coming back from an ankle injury sustained in the quarterfinal round at the Asian Games. Nasya Dimitrova and Gergana Demitrova led Bulgari to victory, notching 28 and 20 points, respectively in the marathon match. Onuma Sittirack posted 24 points to lead Thailand, followed by Thinkaow, who contributed 18 points in the loss. 7th-ranked Italy rallied back after dropping the opening set to secure a 3-1 upset victory against 5th-ranked Russia Wednesday night. With the win, the Italians clinch a qualifying spot in the 3rd round of FIVB Women’s World Championship play as the last-remaining undefeated team in Pool F (8-0, 24 points). The Italians used a dominant blocking front (15 to 8) and serving edge (4 to 3) to hand Russia the loss. Paola Ogechi Egonu posted 29 points, followed by Miryam Fatime Sylla’s 13 points to guide Italy to the win. Russia was led by Iraina Voronkova and Kseniia Parubets, who registered 21 and 13 points, respectively in the match. Top-ranked China surged past the 2nd-ranked United States 3-0 on Wednesday night to secure a berth to the 2018 FIVB Women’s World Championship third round. The Chinese, who limited errors to 8, used an impressive blocking effort (9 to 3) and 3 service aces to hand the Americans their first loss of the tournament. Ting Zhu (19), Xiangyu Gong (14) and Ni Yan (11) contributed double-figure point to lead China to victory. Jordan Larson and Michelle Bartsch-Hackley led the Americans with 14 and 9 points, respectively. The United States can earn a bid to the 3rd round with a victory against Italy on Thursday night. If the Americans were to lose that match, they could still move on in the competition if China defeats Russia tomorrow.